T-R PHOTO BY THORN COMPTON - Marshalltown forward Pablo Cuevas Montes (22) sends a header toward the goal during the first half of the Bobcats’ 2-0 win over Class 2A No. 9 Denison-Schleswig on Saturday in the Des Moines Roosevelt Invite at the Cownie Soccer Park. MHS also beat 3A No. 13 Davenport North for a 2-0 record on the day. 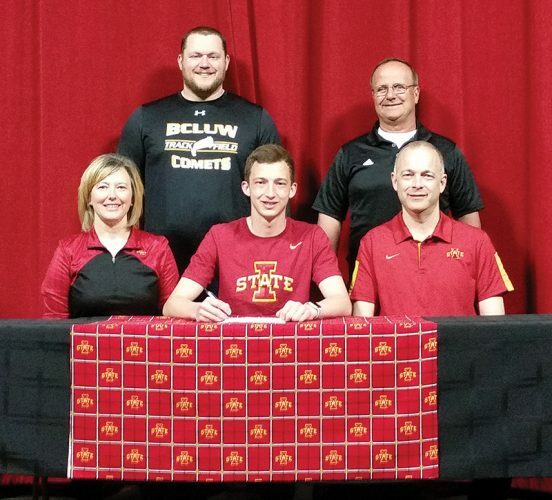 DES MOINES — A loss in the season opener and a cancellation of its home opener marred the start of the first week of the season for the Marshalltown boys soccer team, but on Saturday the Bobcats showed their mettle. 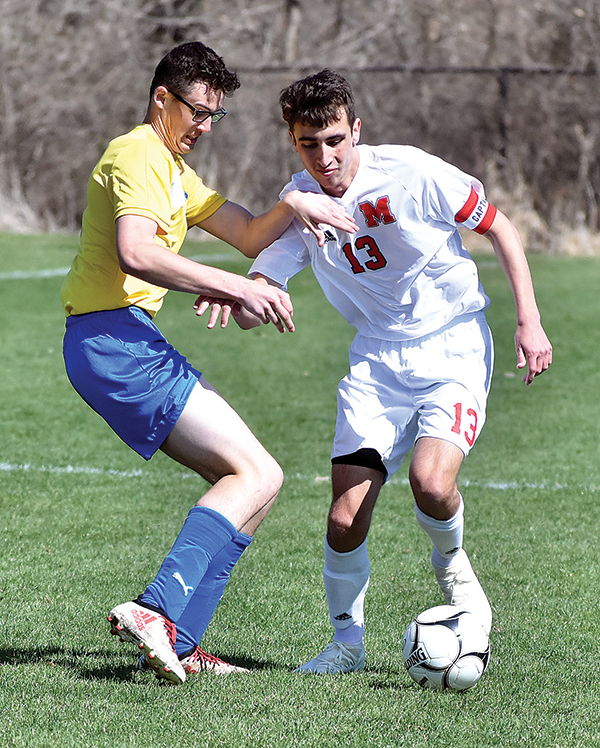 The MHS boys picked up their first two wins of the year with a 4-0 shellacking of Class 3A No. 13 Davenport North and a 2-0 victory over 2A No. 9 Denison-Schleswig in the Des Moines Roosevelt Invite at the Cownie Soccer Park on Saturday. 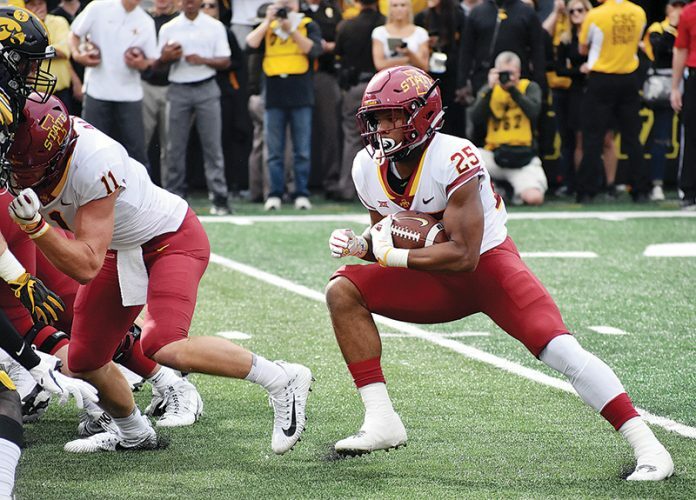 The wins marked the first and second at the varsity level for new head coach Scott Johannes, and he said the best outcome from the games was his guys finally getting out and stretching their legs. “It was a good thing to get these in, start playing and move around so we can see some things and get more comfortable on the pitch,” Johannes said. Even though the Bobcats (2-1) outscored their opponents by a combined 6-0, that doesn’t even show how dominant they were on the day. 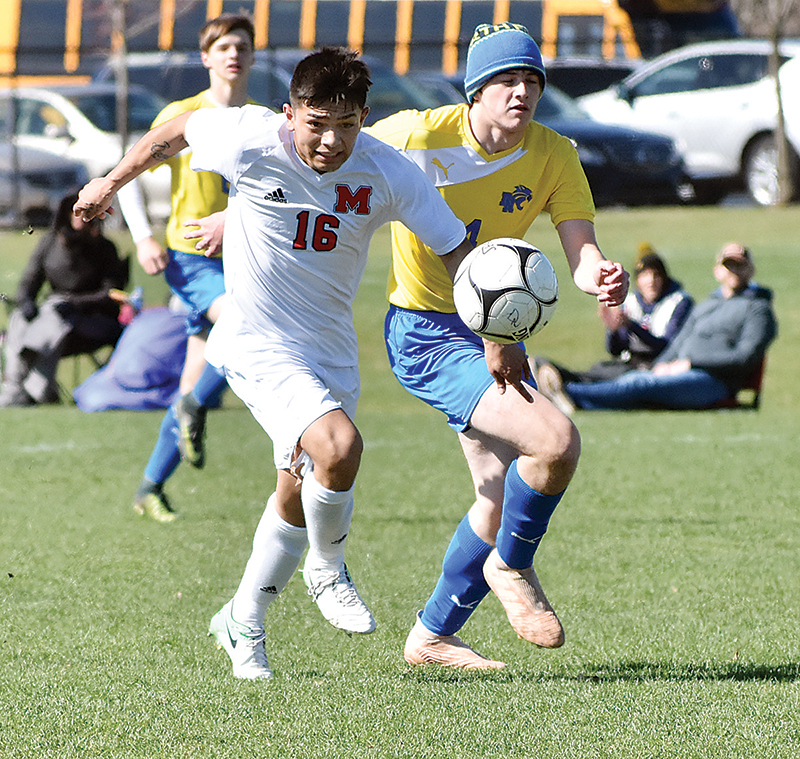 Against Davenport North, Marshalltown had 15 shots on goal and finished with an 18-5 shot advantage, and against Denison-Schleswig it was a 19-1 shot discrepancy. Johannes said the only disappointing part of that stat was his boys weren’t able to score more. T-R PHOTO BY THORN COMPTON - Marshalltown’s Brandon Ordaz (4) is congratulated by teammate Alex Angel Fernandez, left, after Ordaz’s goal in the first half of a 4-0 win over Class 3A No. 13 Davenport North in the Des Moines Roosevelt Invite at the Cownie Soccer Park on Saturday. 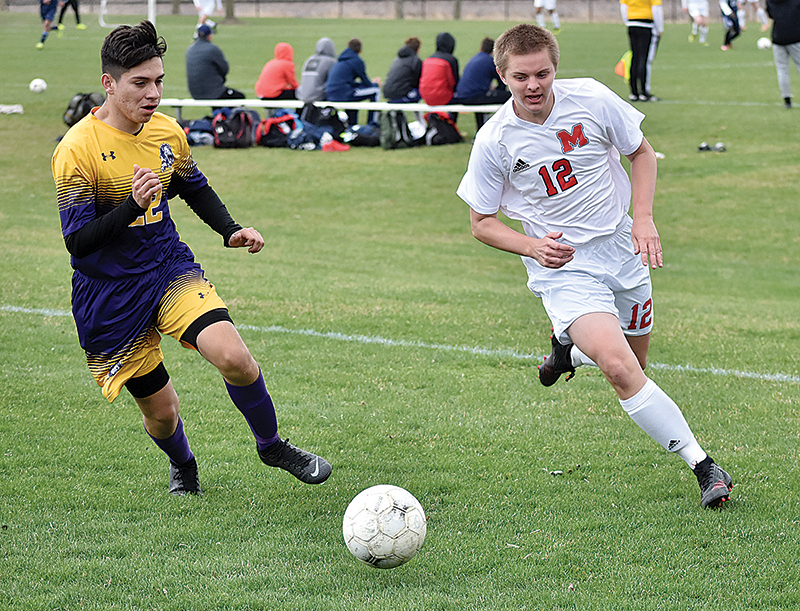 Junior Jose Torres, who was the team’s leading scorer last season, found the back of the net for his first three goals of the year, one coming in the second half against the Wildcats and two coming in the first half against the Monarchs. Even with his personal success, scoring on three of his 10 total shots on the day, Torres said he feels the offense could have flowed better. That ability to accept his personal success and realize there are areas to improve is just one of the reasons Johannes said Torres has developed into a great leader both on and off the pitch this year. T-R PHOTO BY THORN COMPTON - Marshalltown junior Austin Shomo (13) fights for possession with Davenport North’s Dustin Rubemeyer during the second half of the Bobcats’ 4-0 win over the Class 3A No. 13 Wildcats on Saturday in the Des Moines Roosevelt Invite at the Cownie Soccer Park on Saturday. Torres had all the scoring in the second game, but the first game saw four different Bobcats hit paydirt. 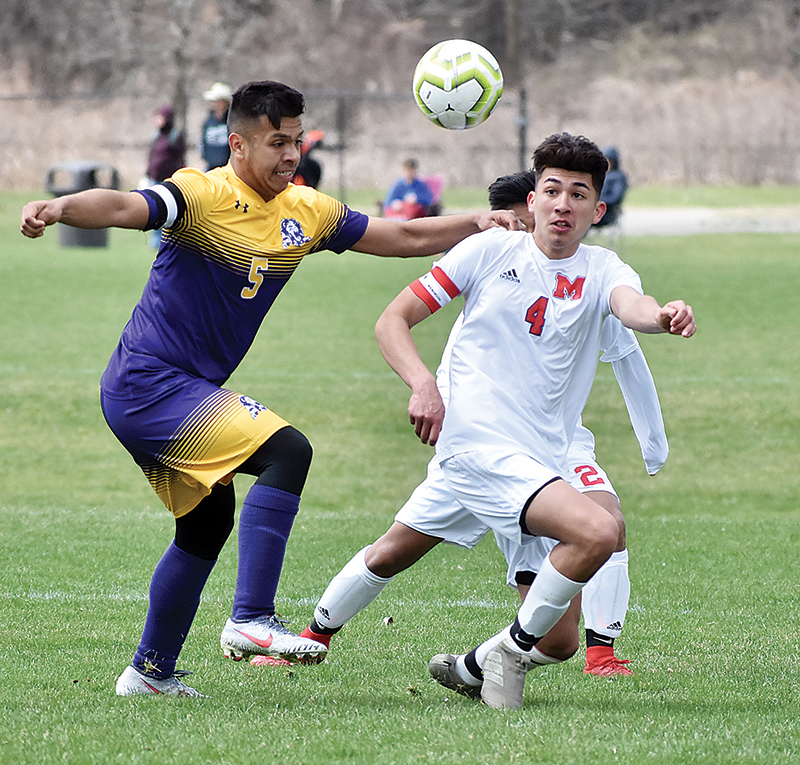 Ronaldo Ordaz broke the seal for the season with his goal midway through the first half against Davenport North, then a few minutes later Brandon Ordaz followed to make it 2-0. Torres got his first goal against the Wildcats early in the second half, then once again a few minutes later Rene Hernandez followed to make it a 4-0 advantage. Johannes said that second half against Davenport North specifically was how his boys need to try to play the whole year. The offense was of course flowing, putting up 37 shots in two 60-minute games, but the defense that allowed just six total shots and three on goal in that same stretch is what Johannes said he was mainly excited about. Marshalltown opens up a three-game home stand this week on Monday with its home opener against 2A No. 10 Newton. Johannes said heading into this week with two wins under their belt is nice, but the road is only beginning for his Bobcats. Goalkeepers — DN: Donovan Weaver (15 shots on goal-11 saves); MHS: Jesus Munoz (1-1), Ernesto Tellez (1-1). Shots — DN 5, MHS 18. Shots on Goal — DN 2, MHS 15. Corner Kicks — DN 2, MHS 1. Yellow Cards — Francisco Mercado, MHS. Goalkeepers — DS: Efren Magana (9 shots on goal-7 saves); MHS: Jesus Munoz (1-1). Shots — DS 1, MHS 19. Shots on goal — DS 1, MHS 9. Corner Kicks — MHS 13. 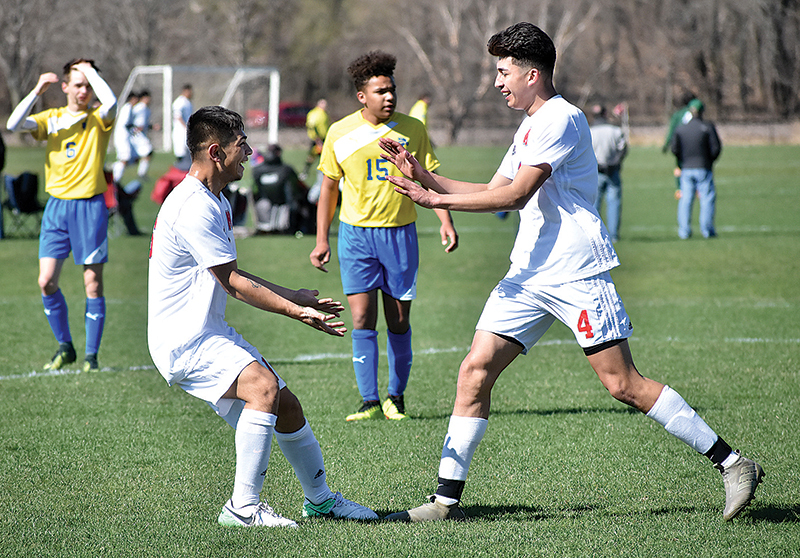 T-R PHOTO BY THORN COMPTON – Marshalltown’s Brandon Ordaz (4) is congratulated by teammate Alex Angel Fernandez, left, after Ordaz’s goal in the first half of a 4-0 win over Class 3A No. 13 Davenport North in the Des Moines Roosevelt Invite at the Cownie Soccer Park on Saturday. 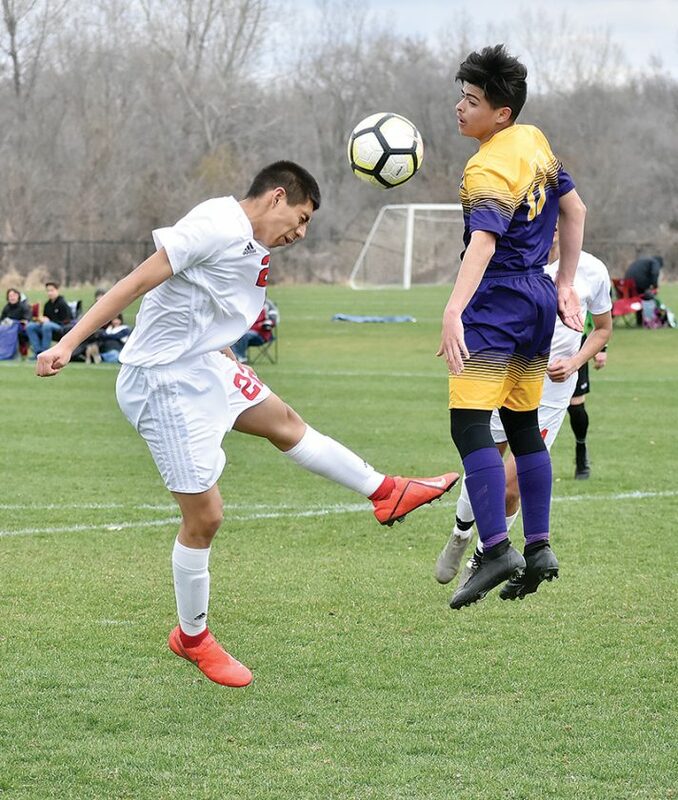 T-R PHOTO BY THORN COMPTON – Marshalltown forward Pablo Cuevas Montes (22) sends a header toward the goal during the first half of the Bobcats’ 2-0 win over Class 2A No. 9 Denison-Schleswig on Saturday in the Des Moines Roosevelt Invite at the Cownie Soccer Park. MHS also beat 3A No. 13 Davenport North for a 2-0 record on the day. T-R PHOTO BY THORN COMPTON – Marshalltown junior Austin Shomo (13) fights for possession with Davenport North’s Dustin Rubemeyer during the second half of the Bobcats’ 4-0 win over the Class 3A No. 13 Wildcats on Saturday in the Des Moines Roosevelt Invite at the Cownie Soccer Park on Saturday.